Happy Super Bowl Sunday to you, happy snack day to me, and happy birthday to Sonja of A Couple Cooks! Today, I’m popping in to share a delicious appetizer from Sonja and her husband Alex’s new cookbook, Pretty Simple Cooking. 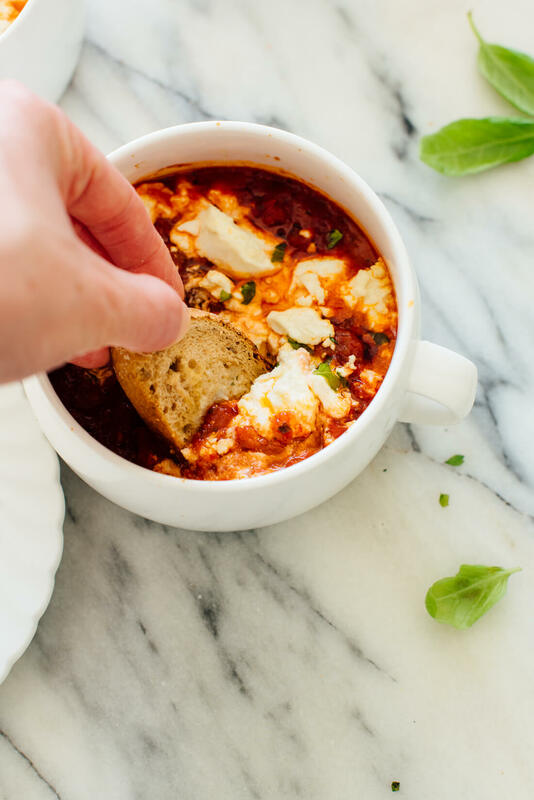 This baked goat cheese dip features a simple, marinara-like tomato sauce with goat cheese on top. Fresh basil and crusty whole grain bread take it to the next level. This recipe is easy to make and definitely a crowd pleaser. If you don’t have a chance to make this appetizer today, it also makes a lovely light dinner for two. Sonja and Alex recommend serving it with red wine and marinated olives, and that sounds like a good idea to me. Sonja and Alex are full of good ideas! I think you’ll really enjoy their new book, Pretty Simple Cooking, too. It’s bursting with 100 simple, delicious, vegetarian recipes, and each recipe has its own photo. Between the chapters, they offer 10 life lessons for a sustainably healthy approach to cooking, artfully illustrated with custom watercolors. The book will be officially released on Tuesday. Pre-order now or keep an eye out for it on bookshelves near you! 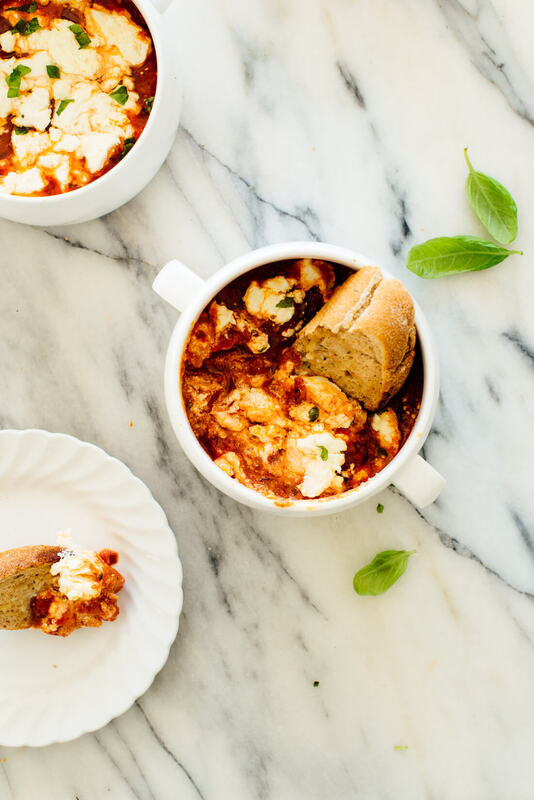 Enjoy this goat cheese and tomato sauce dip as an appetizer or light meal. It’s creamy, saucy and easy to make. This recipe doubles easily; use a 28-ounce can of tomatoes and double the remaining ingredients. Recipe as written yields 4 appetizer servings, or a light dinner for 2. In a medium saucepan, warm the olive oil over medium heat. 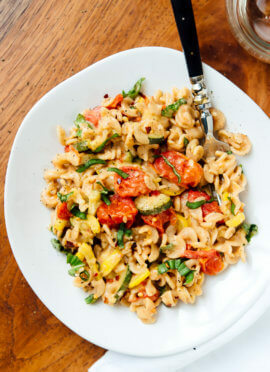 Add the onion and sauté for 3 minutes, then add the garlic, red pepper flakes, 1 tablespoon of the fresh basil (or ¼ teaspoon dried), and oregano, and sauté for 1 minute. Add the white wine vinegar and sauté for 1 minute, then carefully add the tomatoes, salt, and several grinds of black pepper. Reduce the heat, cover, and allow the mixture to simmer, lightly bubbling, for 10 minutes. 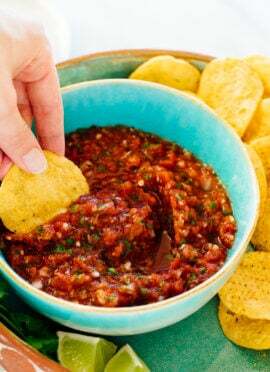 Taste and adjust seasonings as desired (if you want a spicier dip, add more red pepper flakes!). 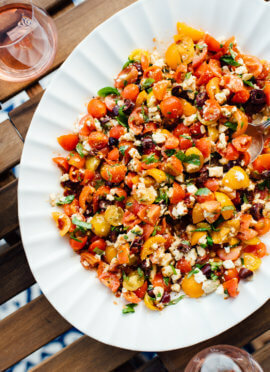 Spoon the tomato sauce into shallow baking dishes or ramekins, then add dollops of goat cheese. Bake until the cheese is warmed through, about 15 minutes. If desired, broil for a minute or two to brown the top of the cheese. Let the dip cool for a few minutes, then top with the remaining 1 teaspoon fresh basil (optional) and a light drizzle of olive oil. Serve warm, with crusty bread on the side. 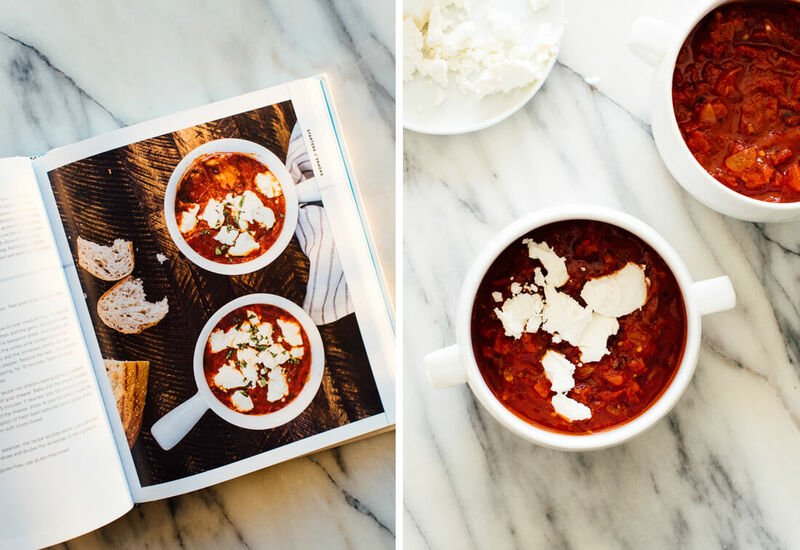 Recipe Excerpted from A Couple Cooks | Pretty Simple Cooking: 100 Delicious Vegetarian Recipes to Make You Fall in Love with Real Food by Sonja Overhiser and Alex Overhiser. Copyright © 2018. Available from Da Capo Lifelong Books, an imprint of Perseus Books, LLC, a subsidiary of Hachette Book Group, Inc.
Make it gluten free: The dip is gluten free. Just serve it with gluten-free bread or sturdy gluten-free crackers. Recommended equipment: I baked this dip in two onion soup bowls from CB2 (affiliate link). this sounds absolutely delicious, just perfect for a chilly night. It is perfect for a chilly night! Oh my gosh…I need this ASAP! This looks so yummy! I love the bowls as well :) Cheese and tomato sauce always make a great meal! Let me know what you think, Amber! This looks so delicious! I have to agree with the comment from “Eating Brownies” that this is perfect for a cold night or just wintertime in general! Thanks so much Kate! Kathryne, thank you so much for this very kind feature of our book and recipe! Your support along the way has been incredible and it’s been amazing to watch you rock it with Love Real Food. 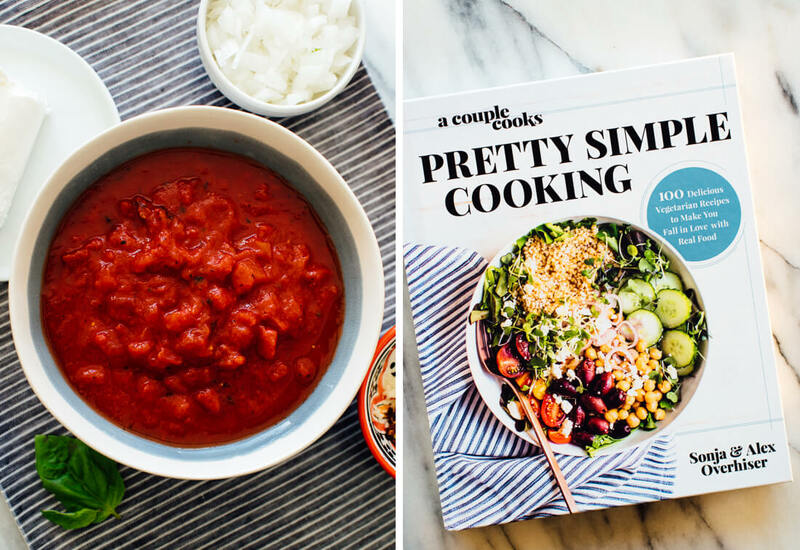 We love seeing it on the bookshelf next to Pretty Simple Cooking here in our kitchen! Sending big love (and Luna says Hi to Cookie)! Quick question because I am a goat cheese fanatic: Does it matter what type of goat cheese you use? There is a large variety of goat cheeses out there. 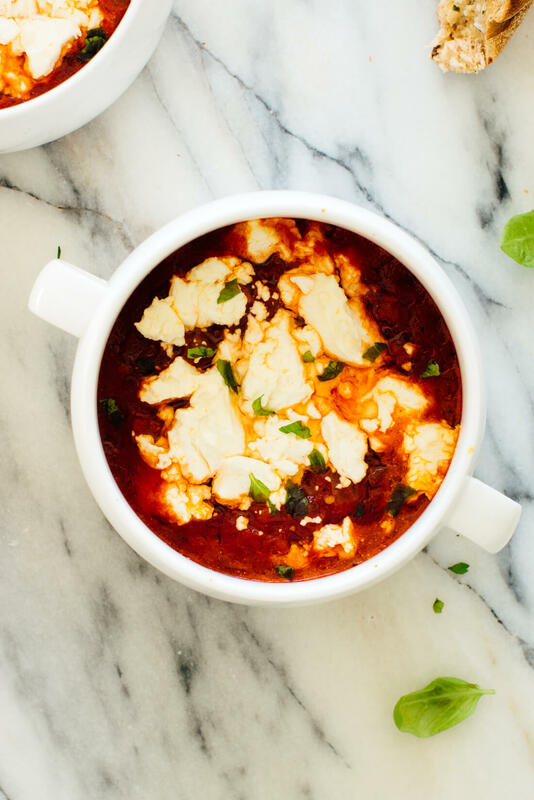 I know you are using a soft goat cheese for this recipe but have you tried using other types? I’m not quite sure what you mean, Emily? Are you referring to log goat cheese vs pre-crumbled? You can buy goat cheese Brie and/or a dense hard cheese goat cheese like Garrotxa. I was just wondering if you have tried the recipe with any different types of options. I know of at least 10ish different types of goat milk cheese. I’m just a crazy cheese loving gal. Katie, this recipe sounds so lovely! I just love goats cheese. I can’t wait to make it and dig in some fresh bread. Yumm!! Let me know what you think, Nora! Thank you so much for sharing this recipe! I ended up making this AND using your next post of roasting a spaghetti squash. Followed both exactly. I was going to just use the goat cheese tomato sauce as a side with sliced baguette, but it was all so good I ended up dumping it right on top of the perfectly roasted squash. I mixed in some spinach so I could say I had my greens too. Wonderful dinner! Great combination! Thanks for sharing and for the review, LT.
Bought some ramekins to give this recipe a go. Very pleased I did as it was excellent. Delicious and surprisingly substantial for what was intended as a light dinner for two. A new regular. Thank you. Great to hear! Thank you for your review, Greg.